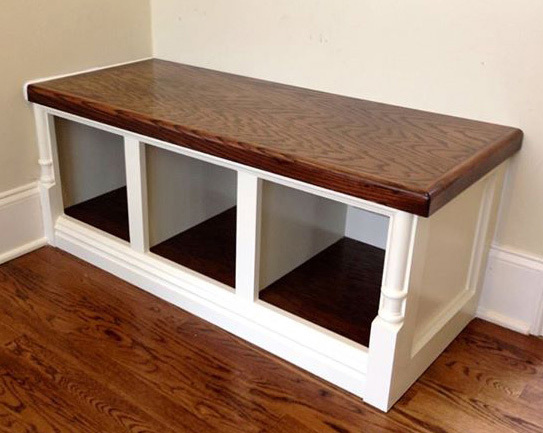 Larry Webb has created the bench portion a beautiful built-in cubby. The bench base was painted in GF's Antique White Milk Paint and the top was stained with GF's Spiced Walnut Liquid Oil Based Wood Stain. All stains must be sealed with top coat. We recommend sealing GF's Liquid Oil Based Stains with Arm-R-Seal. Milk Paint is durable as a stand-alone finish on low to medium-wear surfaces. If you are working with a high-use surface like kitchen cabinets or table tops, we recommend sealing Milk Paint with High Performance Top Coat. Flat Out Flat top coat should only be used on low to medium-wear surfaces. Enduro-Var should not be used on the same project as an oil based product. However, you can apply High Performance and Flat Out Flat over an oil based finish so long as you let the oil based finish dry a minimum of 72 hours.